I'm all for green and orange, personally. All i know is the U, are there pro teams that use green and orange ? can´t think of one ! The Dolphins are the only team that comes close. I would think its a misdirection attempt by the Bucks to throw people off. A cleverly disguised leak... "Whoops, look what we posted on FB." Think about it. With social media and rebrands leaked before release (especially here lol), it makes perfect sense for the Bucks to pull a misdirection. Do you really think they would go into that much effort just to "throw people off" ? Unless that is an attempt to match the old bango color, it is a huge fricking mistake. I think that's what it is. I don't mind it as long as green is primary. FWIW, guy on twitter says he saw the uniforms. Said the new colors are hunter green, royal blue (that they're calling lake blue), cream and black. 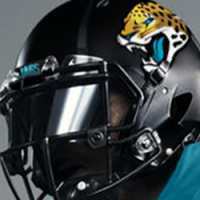 Also said there will be a black alternate uniform with the logo instead of script. Wow... if true, it seems like a look is going on. If there's no kelly or lime, how could the Irish rainbow be back? Lime NEEDS to be included into the new set. Yeah that part didn't make much sense to me either. I'm not sure if the guy has credibility or not. He doesn't have a huge following but seems to be a Packers/Badgers fan from his twitter page and is a retail buyer for the Astros. My only thought was maybe there was confusion on what the "Irish Rainbow" is. Maybe a combination of Green/Blue/Cream (or black) instead of the triple green. This...from the twitter posts and multiple sources confirming blue green cream and maybe lime to the recent Facebook post of orange (HIDEOUS) and green.. im completely confused. I went from intrigued and excited (irish rainbows) to extremely disgusted at the orange/green combination. Yeah, I've been working on mocking that up on some uniforms but have had a hard time making it work. I even used a lighter shade of blue. I agree that it just looks a little muddy without a brighter color (such as a lime or even a kelly green) to help make it pop. Now looking at that...uuuuggghhh soo hard to contrast. Blue green and cream! !! Orange actually would work. If they use it to replace brown. But whenever you search any uniform board. RealGms, Yahoo, here..
We all agree on the Irish rainbows. Green lime green white and maybe silver or cream. Nuff said. Hunter Green and cream with blue and black accents. An all new wordmark. Black alternates with only a logo on them. And an alternate logo featuring the state of Wisconsin. Forgot to mention he said the primary logo is similar to current, but a fiercer buck with blue and black accents and an all new wordmark. Here's a more "creamy" version. Oh that's beautiful. Almost has a Minnesota Wild vibe to it (the green sweater), which is a very good thing. I still would like to see Irish rainbow or pine-purple-black (like the 90's alternate), but I'd be very fine with this nonetheless. These would be perfect..all they need to do is indeed add a little lime here and there..with the Irish rainbows. .voila!! This needs something else...as is, with one-color letters and numbers, it looks like a stock high school uniform (especially the jersey). Which might fit, but I'd like to think the Bucks are a couple levels above. Yep. Luckily they don't use traditional block lettering. They're not that far off from looking like a stock catalog team. Probably also worth noting that there was a poster on RealGM before that basically said this same thing and posted hand-drawings of the logos matching the description above. Supposedly the posts were deleted because a team rep saw them and told him to take them down, but a bunch of people took snapshots of it before they were deleted (and obviously we don't know for sure that that's the reason they were taken down). My gut feeling is that the Hunter Green, Cream, and Blue idea is the real deal. I think the orange 4.16.15 thing is related to construction for a new arena or a new corporate sponsorship of some sort (I know some have speculated it could be Harley Davidson). I'm thinking of something more like Tulane, honestly, only with the black and cream.